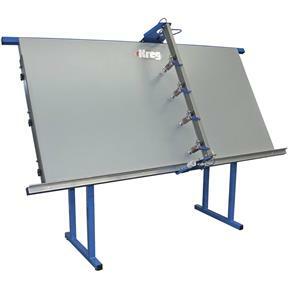 Assembling face frames in a production setting has never been easier thanks to our pneumatic clamping table. This table simplifies the assembly process and provides all skill levels the ability to produce consistently flush frames. This table features a large, 4' by 8' work surface tilted at a 30 degree angle from vertical which allows workpieces to easily fall by gravity into alignment without taking up a lot of space. The squaring fence down the left hand side of the table can be quickly retracted to allow assembly of frames longer that 8'. Four high-quality clamping cylinders glide up and down the transfer arm and can be fired either independently or in unison with the flip of a toggle switch.